We are a big fan of Hazlet! Are you? Why must I always feel the need to confess? The title isn’t my own, I found inspiration (a.k.a I stole it) from the Village of Hazlet’s facebook page (gohere www.facebook.com/Hazlet.Saskatchewan). When I saw their status earlier this year, I knew I needed to use it. Photo Courtesy of Hazlet Facebook Page. Looking down at the Village of Hazlet. Sorry for the digression once again. Back to the purpose of this post and drawing attention to the biggest fan in the community, the Vestas V17 which towers 23 meters above the Village. The wind turbine is currently fulfilling the dubious task of ensuring the heart of the community, the Hazlet Rink Complex, is alive and well. The story for Hazlet seemed to be one stuck on repeat for a host of small communities. The heart of the community was going into cardiac arrest. Without an artificial ice plant the tales of curling games, spirals, attempts to “shoot the duck,” and epic games of scrimmage would have quickly become community folk-lore. Sure families that had the time and energy to travel to neighboring communities would do so and put one more nail in the Village’s proverbial coffin. At Gohere Destinations we are a “fan” of Hazlet because we see a resurgence of the barn-raising mentality that built all communities in Southwest Saskatchewan. Hazlet not only rebuilt their “Barn” they made their community of less than 200 people known for something. 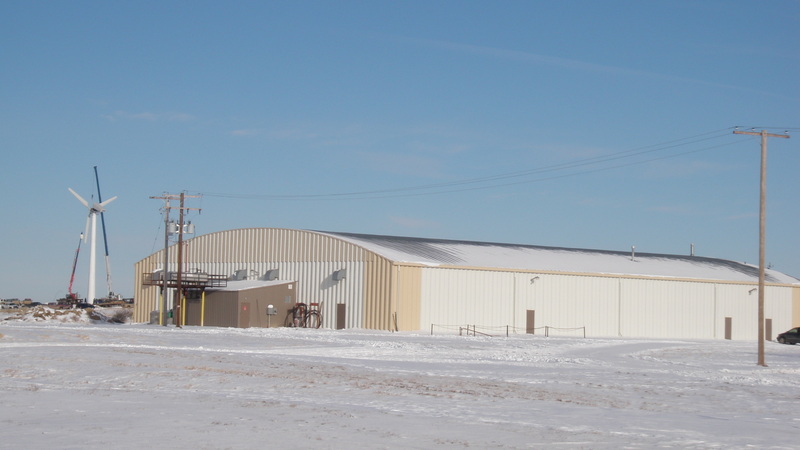 With the help of government grants, over 6000 volunteer hours, thousands of dollars of donations, Hazlet installed the much-needed artificial ice plant and made history as the first wind powered rink in Canada. Why not add a spin to a lazy afternoon, pack up the kids grab your skates from the basement and head to Hazlet for an afternoon of Family fun with a side of education. The rink is warm and friendly and when you’re finished skating wander around the outside of the building to south side of the ice plant to check out the wind turbine production. It is seen on Screen 4 of the SaskPower meter. The meter has a multiplier value of 25, so the real to-date kWh value is simply the value on-screen 4 multiplied by 25. Photo Courtesy of the Hazlet facebook page. The sign within the village boasts their power production. 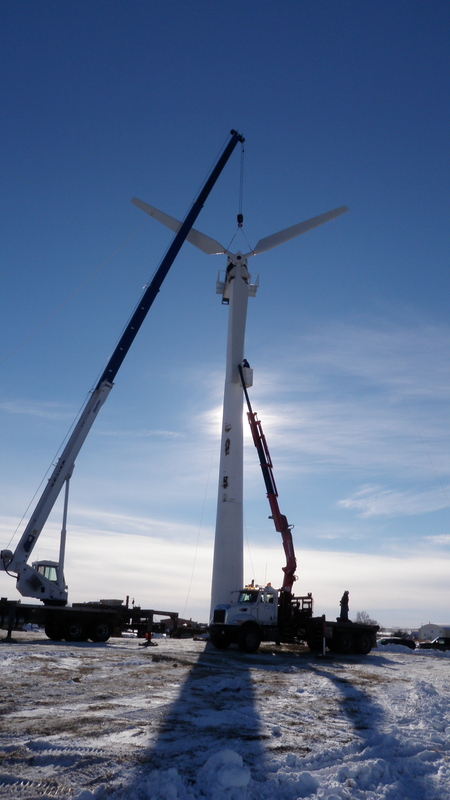 As of the last update the turbine had produced more than 86,000 KWH. I know you will be tired and weary from all that excitement and fresh air. Don’t plan on going home yet. It would be a shame if you left town before stopping at the Java Thyme Cafe for homemade meal, or at the very least a dessert and hot chocolate. For those of you whose mouth starts to water at the site of chocolate, I hijacked the following image from their facebook page (www.facebook.com/JavaThymeCafeHazletSk). Although I have not sampled the dessert I have devoured a bowl of their perogy soup which was on special the last time I was there. Chocolate Almond Torte. Photo Courtesy of Java Thyme Cafe Facebook Page. If you are not from the area, don’t worry about the local coffee-rowers, their bark is much worse than their bite. If you can’t go to Hazlet, at least watch the video below and enjoy. 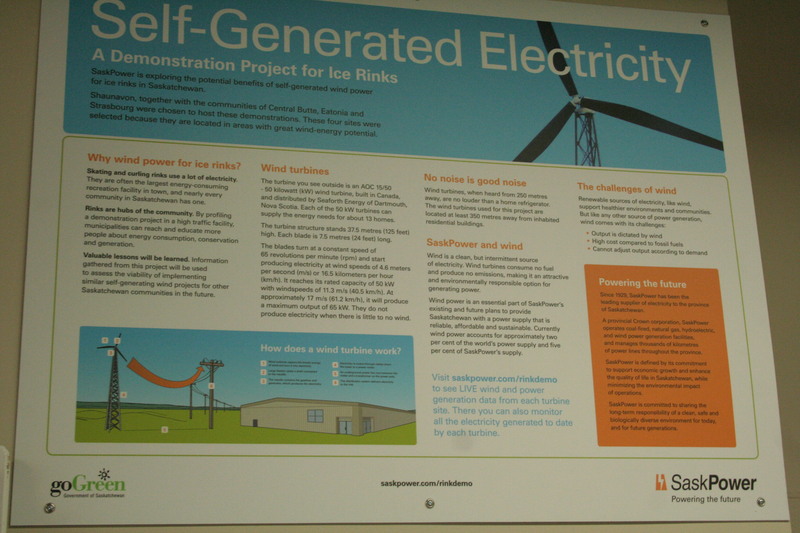 The nearby community of Shaunavon has teamed up with SaskPower and will soon have a wind-powered ice rink as well. The people of Hazlet are proud of their facility as such they take good care of it. We give their facility washrooms two thumbs up. Hazlet is located on Highway 332. 40 minutes from Swift Current and 30 minutes from Cabri, Gull Lake, Abbey and Tompkins. You can reach the community via Highway 32 or 37.